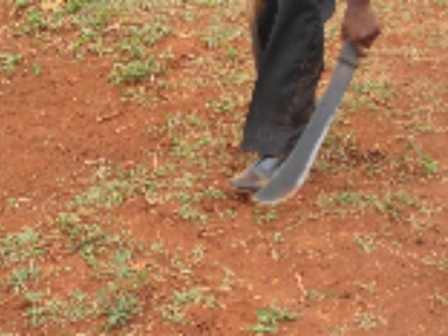 A 25-year-old mentally challenged man has wounded four people including a two year-old child with a machete in Mchinji district. The district’s police spokesperson Kaitano Lubrino identified the man as Montfort Besati and the four victims as Chrissie Joshua, Maxwell Banda, Akimu Kalitsiro and the child as Retisha Boniface. According to Lubrino, the man has been under psychiatric treatment since 2017 when the problem developed. “Last Sunday, he demanded something from one of the victims, Chrissie Joshua who also happens to be his relative but his demand was not met. Later that day, he went into Joshua’s house with a machete and found her baby sitting the two year old child,” said Lubrino. Lubrino explained that while in there, he started harassing the woman whom he ended up hacking on the forehead and also the child on the head. The other victims, Maxwell Banda and Akimu Kalitsiro noticed what was happening and rushed to the scene where they also ended up being attacked by the man. Meanwhile, the four victims have been admitted at Mchinji district hospital where they are receiving medical treatment. Montfort’s condition is also being monitored at the said hospital.